Well, we are officially paid in full, checked in and just waiting at this point! After Blondie's epic vacation ending breakdown on our last Disney cruise, I knew we were going to have to book another. I just didn't know it was going to be so soon. After returning from our Feb 2015 trip, the Star Wars Day at Sea cruises were announced and I pounced on it like nobody's business. I pointed it out to Joe along with the fact that booking then as soon as they are released is more budget friendly and he said go ahead. It's been a long year and I still have 2 weeks until I can tell Blondie about it. We are going to surprise her with a scavenger hunt on her birthday. She is going to have to find and solve the clues to figure out where she is going. I really need to get to work on this! LOL I did buy a SW calendar and stickers the other day. I also have a Stormtrooper dress for her and a Rey costume. This is going to be a 7 day on the Fantasy leaving out of Port Canaveral. Our stops include the Grand Cayman, Cozumel and Castaway Cay. 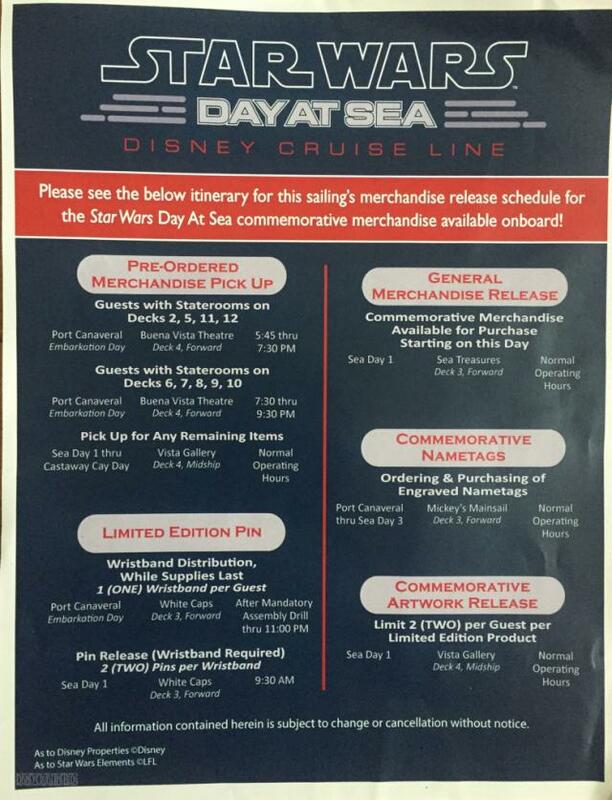 We will have a full day at sea dedicated to Star Wars. And we will still have Pirate night. I already have dinner at Palo booked and I might go for brunch also. So far plans are pretty set. We are driving down to Cocoa Beach Friday morning. We will hit Ron Jon Surf Shop and have dinner at http://www.shilohssteakandseafood.com/ since Blondie loves steak and I'm a sucker for a great view. We are staying at the Hilton Ocean View (yay Hilton Honors points!) We stayed here before our honeymoon cruise. Very friendly staff and close to the port. I have a 10:30-10:45 arrival time for the port. I have http://www.robertoslittlehavana.com/ on my radar for breakfast before driving over. We will park there at the port. I prefer to park at the port so that we are not waiting on transport to our car when we get back. It was so easy last time and it's worth the $120.00 in my opinion. Of course we will stop at 4Rivers in Jacksonville for Brisket and Santa Maria Tri-tip on the way home! So this is it in a nutshell. I fell much better about not planning everything this time. I have already seen navigators from the first 2 sailings and I must admit, it's making me a little giddy. Even the SW stuff. Blondie is going to be over the moon!!! *I promise to take lots of food pics this time around. *I AM NOT standing in line for Anna and Elsa tickets again!!! 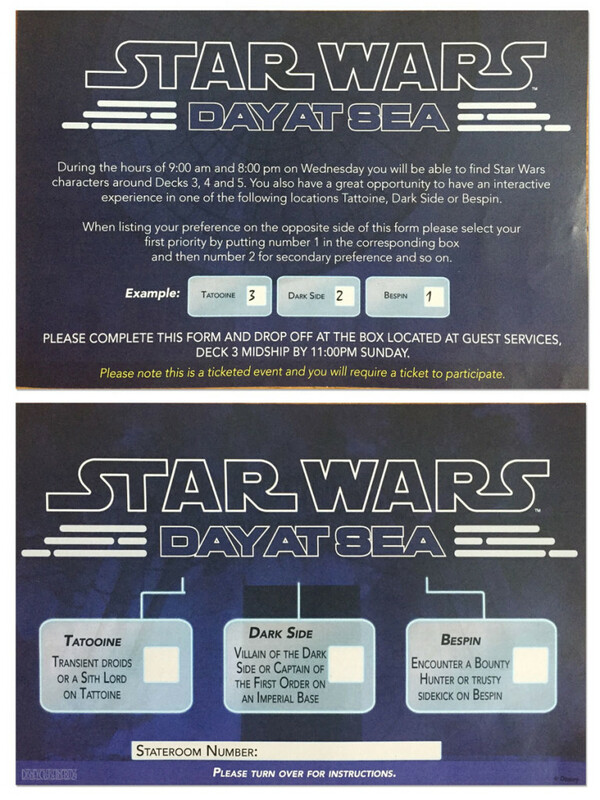 *The Special SW meet and greets have a new system in place, there will be a form in your state room and you rank your favorites for the interactive experiences (Tattoine, Dark Side or Bespin) I guess they will then let you know what you get. I will find the article again and post it here for you to see and to remind myself. There will also be characters on decks 3,4 and 5. *I am not doing Fish Extenders this time. I wrapped presents and wrote out the clues today. I am going to video it so I will share!!!! I honestly don't think it will be feasible to come the weekend after but I may try. I HAVE done 2 weekends in a row once before! If not, I will miss everyone and go the weekend of Mother's Day. We are supposed to go to St Augustine for Mother's Day again but I think I will push for Flower and Garden. I'm really excited to hear about this JMed! We were so close to booking one and I think we would have, but by the time we decided to go for it, the price had jumped substantially! I cant wait to hear all about this!!!! it sounds so much fun and 7 days on a cruise!!! i agree with Allie just have a few days on land for a meet up haha! Sounds amazing can't wait to hear how the scavenger hunt goes! and yes more food pictures! Sounds like a great trip. Disney cruise is on my bucket list. Can't wait for your trip report!